HICT is gaining popularity because of its efficiency and practicality for a time-constrained society. The combination of aerobic and resistance training in a high-intensity, limited-rest design can deliver numerous health benefits in much less time than traditional programs. Because of the elevated demand for exercise intensity in HICT protocols, caution should be taken when prescribing this protocol to individuals who are overweight/obese, detrained, previously injured, or elderly or for individuals with comorbidities. For individuals with hypertension or heart disease, the isometric exercises (wall sit, plank, and side plank) are not recommended. The isometric exercises can be substituted with dynamic exercises. For all individuals, the Valsalva maneuver should be avoided, particularly for the isometric exercises. Proper execution requires a willing and able participant who can handle a great degree of discomfort for a relatively short duration. It is also essential that participants in an HICT understand proper exercise form and technique. As with all exercise programs, prior medical clearance from a physician is recommended. Although HICT can be an efficient means by which to improve health and decrease body fat, it may be inferior to creating absolute strength and power, specific endurance, and other specific performance variables. If these are the goals of a program, as with competitive athletes, traditional programs may elicit greater absolute gains. The following is an example of a 12-station HICT program. All exercises can be done with body weight and implements easily acquired in almost any setting (e.g., home, office, hotel room, etc.). The exercise order allows for a total body exercise to significantly increase the heart rate while the lower, upper, and core exercises function to maintain the increased heart rate while developing strength. Exercises are performed for 30 seconds, with 10 seconds of transition time between bouts. Total time for the entire circuit workout is approximately 7 minutes. The circuit can be repeated 2 to 3 times. Exercises in an HICT circuit should be placed in an order that allows for opposing muscle groups to alternate between resting and working in subsequent exercise stations. For example, a push-up (upper body) station would be followed by a squat (lower body) station. While the participant is performing push-ups, the lower body is not being used significantly and can somewhat recover. This allows for the lower body to have sufficient energy to perform squats with proper form and technique and at adequate intensity. If a particular exercise creates a significant increase in heart rate or intensity demand (usually dynamic exercises incorporating the lower body or whole body), the next exercise functions to decrease heart rate or intensity slightly. For example, a stationary plank or abdominal crunches may follow jumping squats. 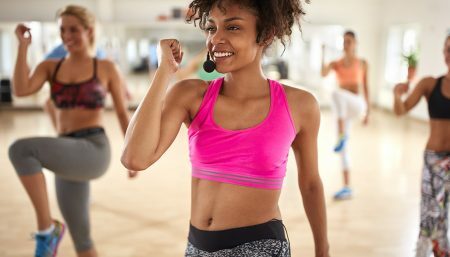 The objective is to allow for a series of exercises to be performed in quick succession — using proper form and technique — and at high intensity with minimal rest between exercises. Generally, the longer the exercise duration, the lower the exercise intensity that can be accomplished. To maximize the metabolic impact of the exercise, time should be sufficient enough to allow for the proper execution of 15 to 20 repetitions of an exercise .A 30-second exercise bout is adequate to allow for this because most participants are able to acquire and maintain appropriate intensity for 30 seconds. Participants can assess absolute intensity by monitoring their heart rate either manually or with a heart rate monitor during exercise. To maximize benefits of this type of training, 30 seconds of rest or less has been observed to maximize metabolic impact. Overall, the objective is for incomplete recovery between exercises so the high exercise intensity can be sustained for the short duration circuit, without compromising proper exercise form and technique. For maximum time efficiency, we recommend minimizing (≤15 seconds) rest time between body weight exercises in an HICT protocol to maintain appropriate exercise intensity. Try the new HIIT Circuits for an effective fat-burning, strength-building workout.